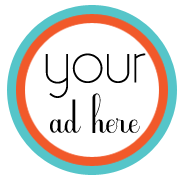 We've got some openings for our Sweet Spot advertising section available in April. If you're interested in advertising with us, just send us your ad in a 200x70 pixel size, then we'll send you an invoice. Our special rate for April is $20 (instead of $35)...this is a first come, first serve offer. For more info on advertising click HERE for our Media Kit and other advertising information. Are you doing any featured or giveaway spotlights right now? Just purchased a "Get in the Spotlight" ad for my blog, Stringtown Home. So excited to be in the spotlight on Blog Guidebook! You guys are awesome!! !